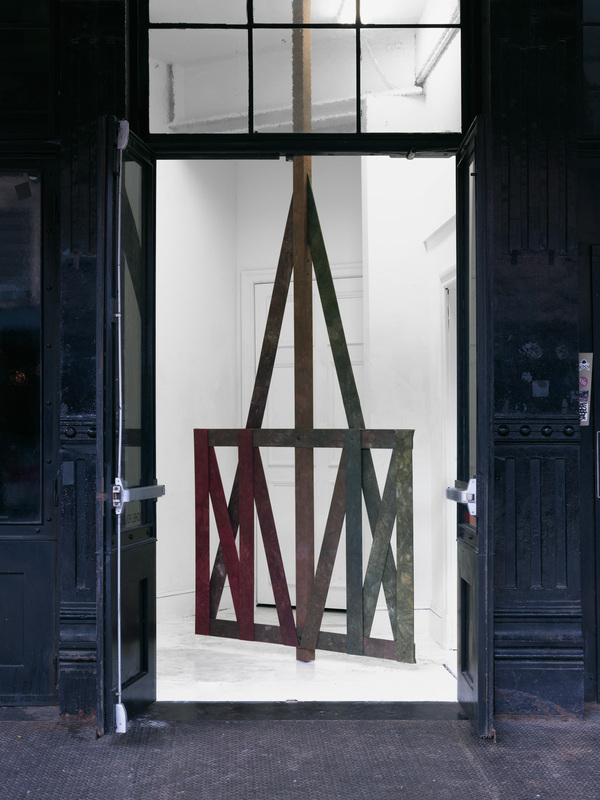 55 GANSEVOORT is proud to present Rachel Foullon's Double Gate, on view 24/7 from August 13 to September 2, 2015. Double Gate is based on rural fencing designed for livestock management. The sculpture spans from floor to ceiling and can turn 360 degrees on its center axis. It is comprised of wood, MDF, hand-dyed canvas and hardware. Double Gate is sized in proportion to the vestibule of 55 Gansevoort -- its five-foot span is the largest circumference possible in the space. The sculpture engages directly with the architecture of the vestibule and its multiple egresses, some operational and some not. For the past decade, Foullon's work has accessed a collective memory existing within the United States of its own history of pioneering farmsteads and the psychological and emotional drives that powered that early westward expansion: the perpetual quest for independence, adventure, prosperity, and property ownership. Rachel Foullon (b. 1978, Glendale, CA) earned her BS from New York University and MFA from Columbia University. Solo exhibitions have been at the University Art Museum, University at Albany, NY; Halsey McKay Gallery, NY; ltd los angeles, CA; Artissima19, Torino, IT and Nicelle Beauchene Gallery, NY. Foullon has participated in recent group exhibitions at SculptureCenter, Brennan and Griffin, Wallspace, and Kate Werble Gallery in NY; Philbrook Museum of Art, Tulsa, OK and Fourteen30 Contemporary, Portland, OR among others. Awards, commissions and residencies have been granted to the artist by NYFA, Foundation for Contemporary Arts, Public Art Fund, Dieu Donne Papermill and others. Foullon is represented by Halsey McKay Gallery.